Today is my turn for the Safari Moon blog hop. Safari Moon is Frances Newcombe’s first collection with Art Gallery Fabrics. Frances has intertwined the serenity and grandeur of the African plains in a rich palette of my favourite colours. 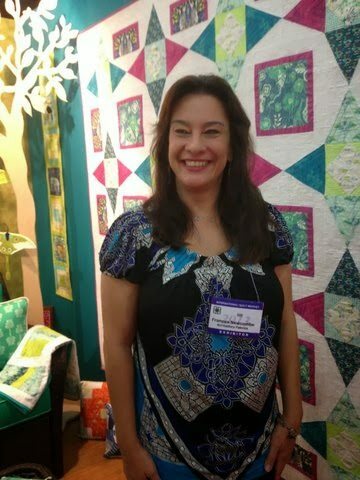 This is the lovely Frances who is standing in front of her award winning booth at Fall Quilt Market 2013. She is such a talented fabric designer, animation artist and all round happy and loveable person. When Frances invited me to join the blog hop, I decided that this time I was not going to make a quilt. 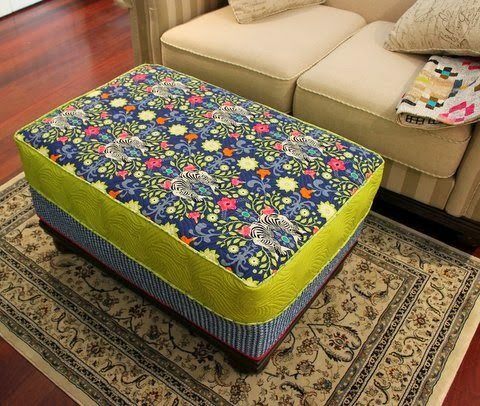 I had a cream footstool that needed protection from two boys and a dog, so I decided to make a quilted, fitted cover. Quite a simple process, although I think I am piping challenged. I need to work on that technique. There was no question of which fabric I would use for the cover. I fell in love with the zebras the moment I saw them at market. The pattern repeat was perfect for the area on the top cover. I used Animalia Splendid for the top cover, River Shadows Chartreuse for the piping and Tribal Stripe Pond for the skirt. 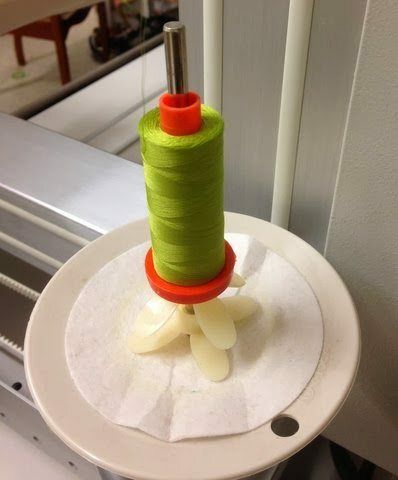 I also used a beautiful green Pure Elements solid for the skirt and hot pink for the binding. All the pieces were heavily quilted with an animal stripe pattern using Aurifil 50wt 1147 green cotton. Don’t forget to visit everyone’s blogs to see their gorgeous projects and leave a comment on Frances’ blog to win a FQ of the whole Safari Moon collection. Thank you Frances for allowing me to participate in your blog hop. (I am planning my next project using Safari Moon as I write this post.) I can hardly wait to see your next collection. Add your Safari Moon projects to the Flickr group or tag #Safarimoon on all social media. « A year of Mod Aus Bee blocks. Wow the footstool is stunning! wonderful cover! It reminds me that I need to recover ours. LOL! What a beautiful footstool! I have not heard of this designer ( not sure if I've been living u der a rock or what) but I LOVE IT!! I must get some and entering this giveaway is a good start! Great project! I love the fact that you could find just the right pieces to make a not-to-girly footstool. I just love those cute zebras! I am piping challenged, too. I have watched lots of video tutorials but I guess it is not exactly the same as actually practicing. You seem to have mastered it! What a great makeover for your footstool!! Love that zebra fabric!! Amazing job on your footstool! I really like the three fabrics you chose…it looks beautiful! what a brilliant idea – I love it! What a great project and what a great outcome!! Great cover for your footstool!! I love the fabrics from the line that you chose too!! I love your footstool – the zebra print is my favourite too! Fabulous, Jane! Such a great use for that Zebra print! That's a pretty place to put your feet. Oh, what a GREAT idea!! I love how yours turned out, especially using those fabrics. I'm all inspired now! I have several footstools and ottomans, love them, big and small. I need to try this.Thanks for the inspiration. Jane Brilliant it looks fantastic. Well done what wonderful fabric choices. it looks great! My footstool is desperate for a new cover! Love the bright colors on the footstool. Shouldn't have to worry about someone falling over it either! 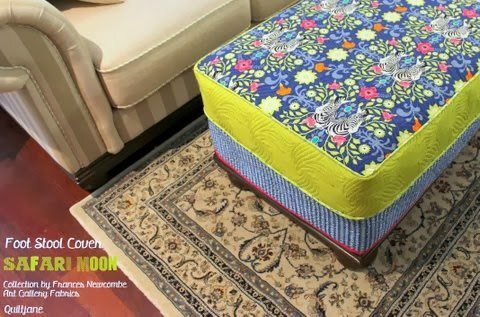 Love the bright colors on your footstool. Shouldn't have to worry about someone falling over it either! Great "upholstery" …esp love the colours..chartreuse is a gorgeous blender I reckon!